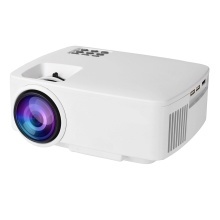 TZ80 LED Projector is specially designed for home theater, entertainment, business conference, education training, etc. Its physical (native) resolution is up to 800 * 480 Pixels. Supporting a variety of video, pictures and music formats. And, its 1200 Lumens provides high-definition and bright images. It will bring you munch convenient and unexpected experience whether in your daily life & in your work. Adopt LCD Technology with more than 20000 hours of LED lifespan, features 1200 Lumens brightness, 1000:1 contrast ratio design and 800 * 480 resolution allowing you to watch your favorite movies in high definition. Brightness: 1200 Lumens, Contrast Ratio: 1000:1, this projector provides better color reproduction, better transmittance and better temperature resistance, keeping projection image in focus and color fidelity. Native Resolution 800 * 480p; Aspect Ratio 16:9 / 4:3. Comes with built-in 8ohm 2W speakers, providing cool visual and audio experience. Support multimedia formats, video, audio, picture and text file. Supporting 30-130inches image size and 0.9m-3.1m projection distance, you can also select the optimal size of image via manual focus to obtain the best using experience. It also supports ±15° keystone correction. Various Interfaces include HD, VGA, USB, AV, 3.5mm audio jack, perfect for you to connect to Laptop PC, TV, DVD player, speakers, U disk and other suitable external devices. OSD Menu Languages: Chinese, English, French, German, Spanish, etc.